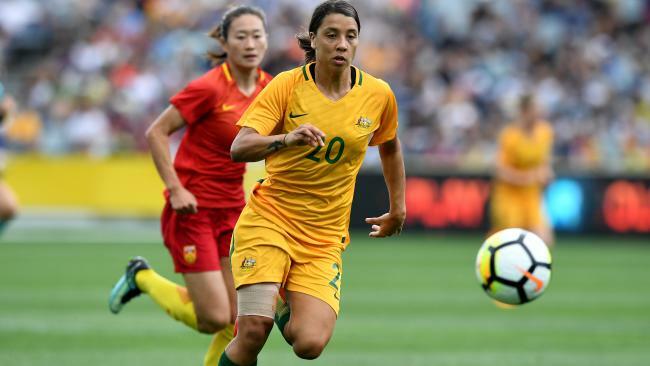 Sam Kerr will be an integral part of the Matildas’ push for the Asian Cup crown. THE Matildas are Asian Cup favourites but coach Alen Stajcic is wary of their opponents, expecting "no easy moments" after drawing reigning champions Japan. The dangerous South Korea and Vietnam also lie in wait in Jordan next April, when Australia will play for not only the silverware but also a spot at the 2019 Women's World Cup. Such is their form, the Matildas should progress to the semi-final stage as one of the top two in Group B, though they will be made to work by Japan and South Korea in particular. Group A features host nation Jordan, and fellow minnows Thailand and the Philippines along with China, who the Matildas twice beat convincingly in Australia last month. "Obviously a very tough draw but one that we embrace and look forward to the challenge of," Stajcic said. "Having a group like this means there are no easy matches and no easy moments. "We have to ensure that we hit the ground running to give ourselves the best possible chance of reaching the knockout rounds." The top five countries will qualify for the World Cup in France. Group B: Japan (8), Australia (6), Korea Republic (15), Vietnam (31).